Taylor told BBC 5 Live: "I find it astonishing that we can import the likes of Jean Tigana and Ruud Gullit and there's no problem, but our own lads who have grown up in this country have not been given a chance to be fairly represented." Taylor said the 'Rooney Rule' had "without a shadow of a doubt made a difference" since it was introduced in the NFL in 2003. "We have got to learn from other sports and other countries, and we saw how many top quality Black gridiron players there were and how few Black coaches," he said. 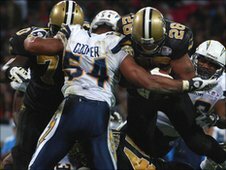 "But they came in with that rule and it's made a difference, and now it's become assimilated into the culture of the NFL." Among its 32 teams, the NFL has seven African-American head coaches and one of Mexican/Puerto Rican descent, Ron Rivera. But by the time the Rooney Rule was introduced, only seven minority coaches had ever held head coaching jobs. Taylor said he would only support the introduction of a similar rule in English football if he "felt encouraged by all my black players or black players who are qualified coaches and feel they have not been given proper opportunities". "If we get more players like Chris Powell who are prepared to go for it and not expect a top job, that's what we need to try and encourage," he added. Powell, the former England left-back, was named as manager of Charlton in January, after a spell as coach and, for one game, caretaker manager at Leicester. Ince, the former Manchester United and England midfielder, has had mixed fortunes during a longer managerial career. He learnt his trade at Macclesfield before leading Milton Keynes Dons to a Football League Trophy final victory in March 2008 and to the League Two title a month later. Ince then became the first black British manager in England's top division when he joined Blackburn Rovers in June 2008 - though he did not hold a UEFA pro licence. However, he was was sacked after six months in charge and three wins in 17 games, and returned to MK Dons in July 2009. He subsequently resigned in April 2010 and joined Notts County six months later. Taylor said Ince should have been fully qualified when he took the Blackburn post, but added: "I spoke to Richard Scudamore [the chief executive of the FA Premier League] and said 'we've got to give him a chance, we have promised that we'll fast-track him and get him qualified'. "I said 'we don't want to make a scene about it but we would do if we needed to'. "But he said, 'Gordon, I agree, we will do all we can'." 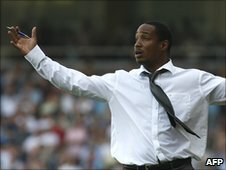 Ince said it was "really hard to comprehend" that would-be managers could lose out on jobs because of their colour. But it would also be hard for him, as an experienced manager, to raise this as an issue if he was unsuccessful. "Are people going to listen to that or just think that's sour grapes because he didn't get the job," he said.